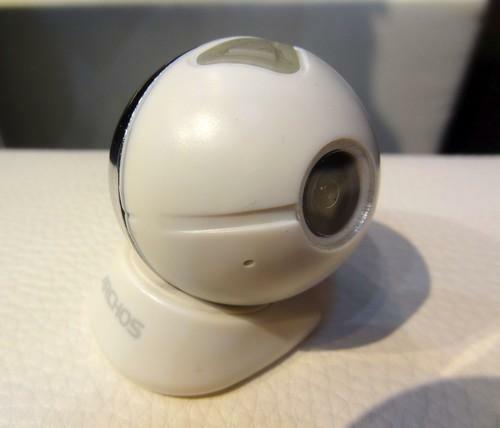 The Archos Mini Cam can swivel in any direction on its magnetic mount. It connects to a hub via Bluetooth LE. If you want to find out how the so-called Internet of things is shaking up the tech industry, Mobile World Congress in Barcelona is the place to be this week. The phrase is becoming more than just hype. On display here at the show are a dizzying variety of networked wearables, car safety and infotainment systems, home monitoring technology and SIMs (subscriber identity modules) for all sorts of consumer and industrial appliances. As businesses including telecom companies, car manufacturers, software-as-a-service vendors and networking equipment makers connect devices at an increasingly rapid pace, they are not only offering new services, but also disrupting their own industries. Industry leaders speaking in panel sessions and keynotes at the show talked about the rate of change in breathless terms. "There's no stopping it," said Joe Tucci, CEO of EMC. "The Internet of things is coming, and you better disrupt or prepare to be disrupted." The term "Internet of things" emerged as a buzzword over the last year or so to describe the phenomenon of network-connected sensors incorporated into devices, such as thermostats, that in the past were standalone appliances. "It's about connecting things together through sensors in a way that helps the consumers," said Cisco Systems' CEO John Chambers. "Think about what you can do for the person watching TV at home when you can put sensors in the shoes of his favorite basketball team or in the basketball," Chambers said. Applications could include displaying analysis of patterns of play and ball movements, he noted. Chambers even used a broader term, the "Internet of everything," including both smartphones and other mobile computing devices as well as Internet-connected appliances. "When I came to Cisco there were about a thousand things connected to the Internet, now there are 10 billion; by the end of the decade there will be 500 billion," Chamber said. Vendors need to make sure they are building products on a consistent underlying architecture, Chambers said. "The trick for winning in the home is to make things easy for the consumer to connect everything." A similar scenario is true for business, Chambers said. "When you can offer customers a consistent architecture, you reduce their capital expenditures for them," by simplifying operations and management of equipment infrastructure and related business processes, Chambers said. There are incentives for vendors to do this. "The financial rewards here get very large," Chambers said. A wide range of industry insiders agree. "Just about every business will become an IoT [Internet of things] business," said Jahangir Mohammed, CEO of Jasper Wireless. "The benefits are so profound that it is inevitable that this will happen." By connecting devices over the Internet and wirelessly over mobile networks, companies can manage a wide range of new services for their customers, Mohammed said. This is why Google announced in January that it would pay more than US$3 billion for Nest's smart thermostat and smoke alarm technology, Mohammed said. "The thermostat is the product but the service is the core," Mohammed said. Jasper offers cloud-based software and services to enable network operators deliver machine-to-machine (M2M) connectivity and diagnostic and management applications to companies in a variety of vertical markets. For example, its Connected Car Cloud, announced Tuesday at the show, is designed to let car makers offer a range of safety, security and infotainment systems. Jasper also announced a Global SIM (subscriber identity module), designed to allow international distribution, activation and management for any device into which the SIM is embedded. A number of auto makers announced connectivity technology this week. "Consumers expect to have the same connected experience with their cars that they have with the mobile phones," said Stephen Odell, president of Europe, the Middle East and Africa at Ford Motor. Ford's new Focus, unveiled at the show Tuesday, has technology to help drivers park their cars. It also lets parents adjust various features when their children drive the car, for example, preventing the radio volume from being turned on full blast. The car's MyKey system restricts the top speed and maximum volume of the radio. All this is being done through special sensors and the Sync 2 system being rolled out in the new models. "Experts think that connectivity will be a key factor in assessing cars," Odell said. "We saw this coming and that's why Ford introduced the Sync systems in 2007." Ford worked with companies including Microsoft and AT&T to deliver some of the automation and communications features in the Focus line. As vendors jostle for position to take advantage of new opportunities, they will form partnerships, noted Bob Sell, chief of Accenture's Communications, Media & Technology group. "New types of partnerships will arise, friends will become and enemies and enemies will become friends," Sell said, "We're going to have to be flexible in this period of transition." Large carriers will have to work with younger, nimbler companies to bring new services to subscribers, said Timotheus Hotttges, CEO of Deutsche Telekom. Operators are going to have build what you could call sockets, working with smaller, new companies that have new applications to let them plug into their architecture, to enable new types of application, Hotttges said. Deutsche Telekom Tuesday said that through a deal with PayPal, it will let mobile users purchase goods and get billed on their regular mobile phone accounts. --China's Huawei announced the TalkBand, priced at €99 (US$136). It offers up to seven hours of calling on one charge and a 1.4-inch flexible OLED display. It supports Android 2.3+ and iOS 5.0+ compatible devices and offers NFC syncing. It's also designed to track activity time and progress, including steps taken, miles covered and calories burned. --French tablet maker Archos showed off its version of Bluetooth Low Energy, used in devices to monitor and control smart devices around the home. Its range of products shown at Mobile World Congress, including cameras, weather stations, movement detectors, door and window sensors and power switches, will go on sale in April. --Sierra Wireless debuted the Linux-based Legato platform, designed to simplify and accelerate the development of machine-to-machine (M2M) applications. --Samsung has put sensor technology into all three Galaxy Gear devices it showed off this week, to allow for heart-rate monitoring. The sensors work with a health app to measure data over time. Samsung said health tracking was a top customer demand for the devices. Is Amazon Advertising a threat, or a boon?